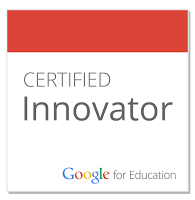 Google Certified Teachers are exceptional K-12 educators with a passion for using innovative tools to improve teaching and learning, as well as creative leaders and ambassadors for change. They are recognized experts and widely admired for their commitment to high expectations for students, life-long learning and collaboration. Exceptional educators with a passion for using innovative tools to improve teaching and learning. Creative leaders who understand their local needs and can spread innovation as a recognized expert. Ambassadors for change who model high expectations, life-long learning, collaboration, equity & inclusion, and innovation. Develop a "Personal Action Plan." Actively participate in the Google Certified Teacher Online Community. Share the impact of their work with other Google Certified Teachers through an end-of-year reflection. Everyone who knows me knows I'm passionate about professional development, and when I read what GCTs are expected to do I'm excited that I will become part of a community dedicated to developing other teachers and promoting Google Apps for Education in my own school. So at the end of what has been a quite a difficult year for me, moving to a new continent, teaching at a new school, facing adjustment issues from my family and so on, I am feeling positive about next year and I'm starting to think that the move we made to Switzerland may just have been the right one after all. Thanks to Doug Belshaw for his blog post which put this whole train of events into motion. Congratulations Maggie - a well deserved testament to all of the hard work you obviously put in. Looking forward to reading more about your experiences as part of the GTA UK.